Rich and Sophie Lyons fend off hordes of the virtual undead at Reality Zombies. Lego lovers and environmental advocates alike can get excited for an afternoon in Canton . Building Blocks Workshop and Deepwater Wind will lead a program at B’nai Tikvah, where families will team up to build windmills and learn how those windmills produce renewable energy. It will take place on Sunday, Jan. 27, from 1 to 3:30 p.m. at 1301 Washington St., Canton. Tickets are $36 per family or $12 per individual. Space is limited. Register at 781-828-5250 or on the events page at www.bnaitikvahma.org. The Spirit of Hanover Community Service Award Committee is accepting nominations for the 15th Spirit of Hanover Community Service Award. The award is presented to an individual who exemplifies the spirit of Hanover by dedicating his or her energy to the town, inspiring others to a higher level of service. Nominations should articulate how the nominee satisfies this criteria. They can be sent electronically to spiritofhanoveraward@gmail.com or by mail to Spirit of Hanover Community Service Award, P.O. Box 214, Hanover, MA 02339-0214. Nominations will not be accepted after Feb. 15. Zombie apocalypse fanatics, it’s time to put your survival skills to the test. 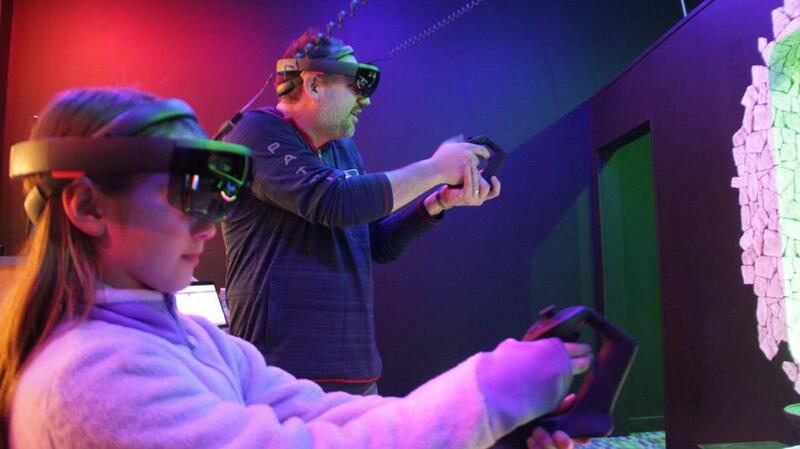 Kingston Collection announced the grand opening Reality Zombies, a holographic augmented reality arcade game. Once players put on the Microsoft Hololens, virtual zombies appear and attack. Armed with a blaster, players must either vanquish the oncoming zombies or be vanquished. Games cost from $10 to $15; recommended for ages 7 and above. Contact 781-400-7079. The Scituate Art Association invites people to take a “Painting for Pleasure” class and acquire new skills in oil painting. Anthony Visco will lead beginners and intermediate oil painters to create paintings inspired by still lifes or photographs. Visco invites particpants who want to paint in an easy-going setting Classes start on Jan. 23 and take place each Wednesday from 10:30 a.m. to 1 p.m at the Bailey-Ellis House. Sessions cost $150 for members and $175 for nonmembers for the three sessions of a five-week course that lasts through May . Contact Janet Cornacchio at jcornacch@aol.com. Fuller Craft Museum in Brockton will showcase Tom Kiefer’s “El Sueño Americano — The American Dream” from Jan. 26 and through July 28. The exhibit features Kiefer’s photographs documenting items lost and left behind by migrants who tried to cross the United States border through Arizona between 2003 and 2014. There will also be a reception that is included with ticket admission on Feb. 3 where Kiefer will speak on a panel. Admission to the Fuller Craft Museum, located at 455 Oak St., is $10 for adults, $8 for seniors, $5 for students, and free for Brockton residents, museum members, and children under 12. For more information, visit fullercraft.org. Ysabelle Kempe can be reached at ysabelle.kempe@globe.com. Annika Hom can be reached at annika.hom@globe.com.